The Eucharist, the Divine Sacrament of the altar, is the source and summit of the Church from whom she draws all her life, all her energy, all her mission. Each Sunday millions of Catholics gather the world over to celebrate an event of cosmic proportions: an event in which the meaning of time itself unfolds; an event of incomparable joy in which the eschatological dimension of man’s existence is encountered, and on which the foundation of hope and joy held in every Christian heart is based. We celebrate, each Sunday, the Resurrection: Christ’s wondrous victory over sin and death, that dawn of the new creation our Savior, as the New Adam, has so graciously won for us. Thus, in the words of the Venerable John Paul II in his apostolic letter Dies Domini (On Keeping The Lord’s Day Holy), Sunday “is the day which recalls in grateful adoration the world’s first day and looks forward in active hope to ‘the last day’, when Christ will come in glory and all things will be made new. . . . Rightly, then, the Psalmist’s cry is applied to Sunday: ‘This is the day which the Lord has made: let us rejoice and be glad in it’” (Ps 118:24). Yet this celebration is not only one in which a memory of a past event is recalled and honored, but rather it is an “entering” into the reality of our existence in relation to the infinite, eternal life of the Holy Trinity; a life in which we are swept up into Life Itself through the reception of the sacrament of Eucharist. It is in this sacrament of sacraments that we come face to face with Christ’s supreme gift of self: his own body and blood. Further, in an act as astonishing as the Resurrection itself, Christ invites us to drink in his true Presence, to consume his true body and blood that we may be nourished and transformed by his infinite love into a humanity far beyond the limits of our imagination. Thus fed by Christ in Eucharist, an encounter in which God meets us directly, enters into us and flows through us, we are transformed into love as we drink in Love, and are therefore swept up into the sublime life of the Trinity. Vatican II proclaimed that through the Eucharist, “the source and summit of the Christian life,” “the work of our redemption is carried out” (Lumen Gentium, 11, 3). Therefore John Paul II is able to say: “The Church has received the Eucharist from Christ her Lord not as one gift—however precious—among so many others, but as the gift par excellence, for it is the gift of himself, of his person in his sacred humanity, as well as the gift of his saving work” (Ecclesia De Eucharistia, 11). 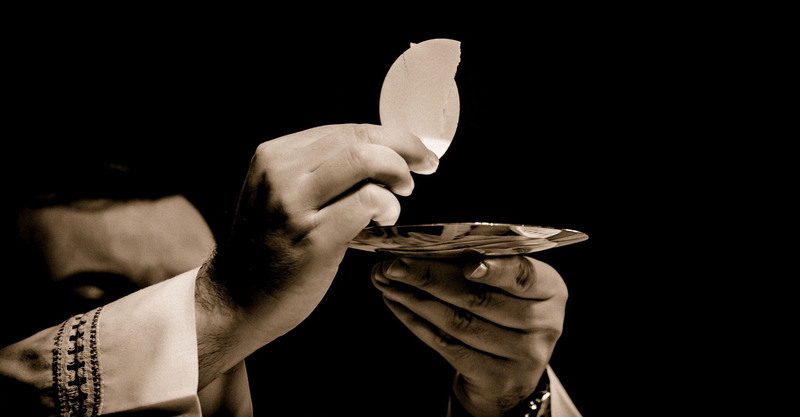 Some insist that Eucharist should be available to all, whether Catholic in full communion with the Church or not, for it was Christ who said, “Do this in memory of me” (Lk 22:19). The notion is that since Jesus held meals with sinners, the Eucharist, therefore, ought to be regarded as a continuation of those same meals. Perhaps these individuals are unfamiliar with—or unaware of—Church teaching on the Real Presence of Christ in the Eucharist: the true body, blood, soul and divinity of Christ present under the signs of bread and wine that has been consecrated by validly ordained Catholic bishops or priests. Perhaps they fail to understand the true meaning of repentance, or the need to be reconciled with Christ and the One Body of his Church before receiving the Savior’s body and blood. Perhaps they have not read of Paul’s statement that whoever eats unworthily, eats and drinks judgment on himself because he does not distinguish the Body of the Lord (see 1 Cor 11:27ff). Whatever the case may be, it is incorrect to view the Eucharist as something that ought to be shared without any conditional limit. Some fall into the temptation of viewing the sacrament of Eucharist as only a shared meal of symbolic bread and wine, one in which we are simply drawn into an act of remembrance of the Last Supper and those events of Christ’s life known as the Paschal mystery. Yet the Eucharist is far more than just a meal. While Catholics understand that they are receiving Christ’s true body and blood, it is profitable to reflect on what our Lord had to suffer in order to provide us with this gift of life we call Eucharist. Cardinal Ratzinger observed that, at the Last Supper, Christ’s words of Eucharistic institution are an anticipation of his death and the transformation of that death into an event of love. Therefore Jesus’ words have creative power for all time “only in that they did not remain mere words but were given content by his actual death.” Yet Christ’s death would be empty of meaning if it were not for the Resurrection, in which it “is made clear that [Christ’s] words were spoken with divine authority, that his love is indeed strong enough to reach out beyond death” (Ibid, 43). Thus Christ’s word, death, and Resurrection make up a whole, and “constitute a veritable reality.” This, Cardinal Ratzinger explains, is the “single mystery of Easter” and “the source and origin of the Eucharist” (Ibid, 44). Since the Eucharist is the gift of Christ’s saving work, we can say that this gift of himself is the gift of life for which all mankind should eagerly thirst. The Eucharist is the “ever-living and life-giving power” (CCC No. 1116) which flows forth from the Body of Christ, nourishing with life those whose love of the Savior has drawn them to the table of the Altar. Indeed, the Eucharist is far more than just a meal. The above post was modified slightly when republished.